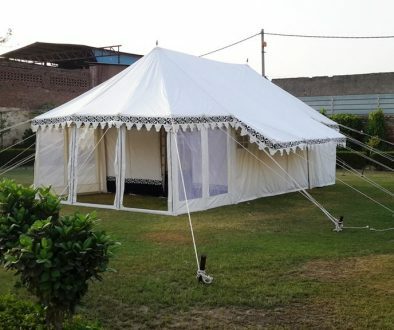 We are leading Manufacturers and Suppliers of Raj Tents, from India. 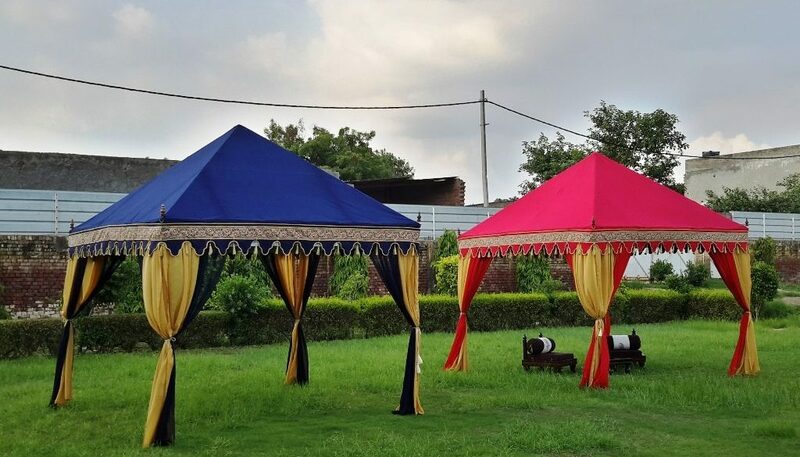 We make beautifully hand crafted tents, in Vibrant Red, Cool Blue & Matt Golden hues. 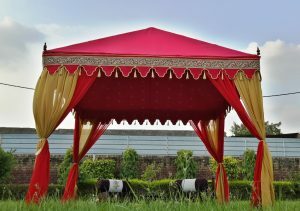 Our Red Party Tent is perfect to set the mood for your Wedding Party and Special Events. 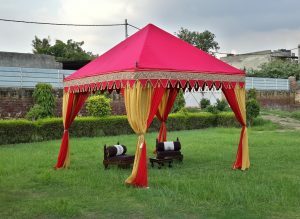 It is also called the best Indian Wedding Tent for the Ceremony. 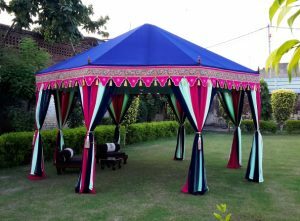 The True Blue Cupola is also a perfect choice for your Marriage Ceremony as the Bride & Groom Tent. 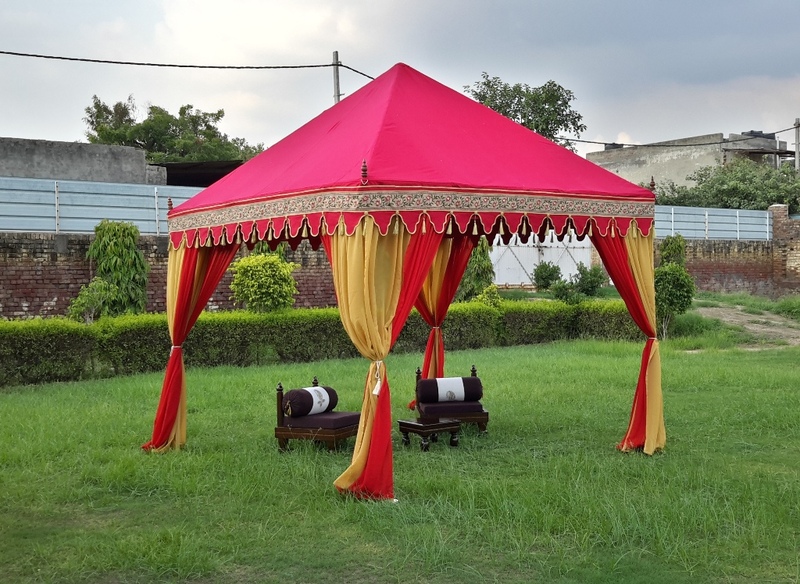 Our Cupola Tents and Pergola Tents are the Best Raj Tents. We have a team of experienced hand craftsmen, that give a special touch to all our tents. Special attention is given to detailing in this Pergola Tent, from matching curtains to Valance and tassels, to intricate mirror work on golden stars, this elegant tent is a class apart in itself ! 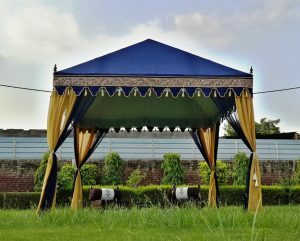 The valance patterns have been hand block printed to give this Indian Tent that Magical effect. 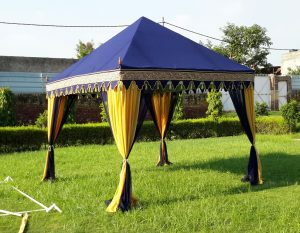 Teamed up with Low Wooden Seats, & coffee tables this tent is a perfect small party tent, for your garden. 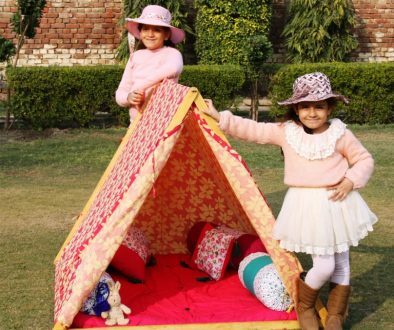 It is a Must buy tent ! 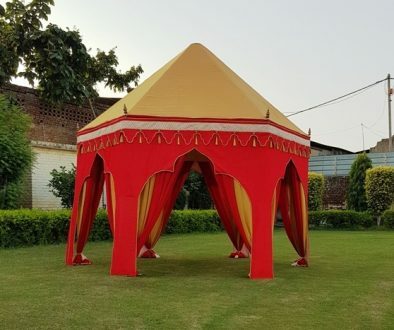 Our Indian Tents comprise of a wide range of Exclusive Pavilions and Grand Pavilions, The Beautiful Raj Tents and The Majestic Maharaja Tents, The elegant range of Royal Arabian Tents and Royal Cabanas. 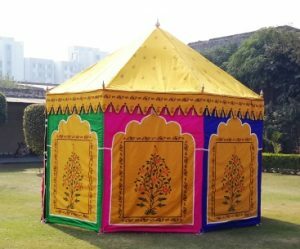 We give beautiful Indian Block Prints on the interiors of all our Indian Tents. Each Tent is hand crafted by our expert and skilled stitching team, to make a Masterpiece of each Tent and Pavilion. You can choose from a variety of colors, materials, sizes and styles. For our Testimonial Section and other New Tents Click Here. Yes Dianna, this is a free standing canopy. It is erected on frame and has full inner area for utilization. Dear Bettina Richter, I have already sent you the email with prices, kindly check and revert. Best regards.